For those who want to bring in their propeller for reconditioning, one piece of machinery that delivers high quality precision is the Hale MRI Propeller machine. Most shops that specialize in propeller reconditioning actually prefer to use these machines. The reason is simple as the Hale MRI reporting delivers extremely precise information to the computer including all detailed measurements of the propeller such as pitch, track, camber, rake and more. This type of data is invaluable as it allows professional shops to repair or recondition propellers. As you can see, just these reasons alone make it worthwhile to take your propeller to a shop equipped with one of these specialized machines. By going into more detail on performance issues, the propellers can be restored for synchronized propeller loading, improved fuel economy and even for minimized noise. These machines are supplied by the Michigan Wheel Corporation and come complete with the stand, table, computer, arbors and measurement arm. As these are special types of equipment, onsite training and setup is available. Some of the features include detailed measurements and reporting of all the features of any propeller and having that data transmitted to the computer in 3D data. Comparison between two propellers is also possible so that exact matches can be compared. So you can be able to better monitor the condition of the propeller, data is also permanently stored prior to and after any repairs. This data can also be exported to any MRI user so that they can be able to use it to make an exact duplicate of a repair previously done. 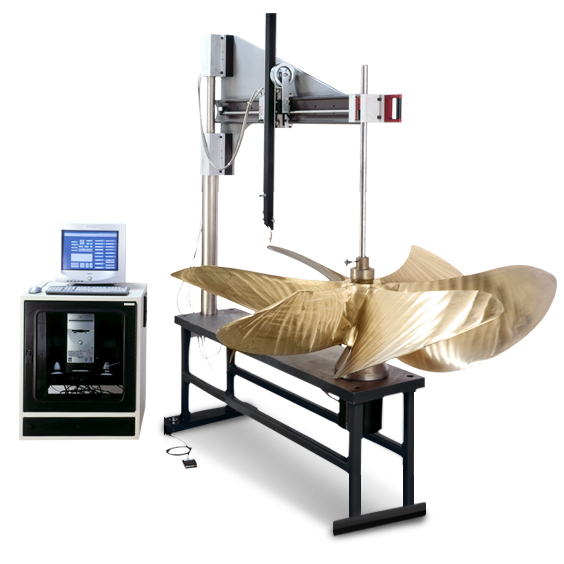 Customers who take their propellers to shops that use these machines can be given different levels of conditioning. These can include restoring it back to original, restoring it for operating condition and even modifying it for maximized performance. If you are looking for the best results for repairs and reconditioning, then the Hale MRI propeller machine is the clear choice. Reach out to Deep Blue Yacht Supply for any Hale MRI machine requests or questions.